You will need Node and npm installed on your machine. A basic knowledge of Angular, Ionic and Node will be helpful. We’ll send our votes to the server and with the help of Pusher, update our polls in realtime. To make use of Pusher, you’ll have to create an account here. The command is merely telling the CLI to create a new app called pollApp and it should make use of the blank starter template. While the setup is running you might get a prompt "Would you like to integrate your new app with Cordova to target native iOS and Android?". If you want to start running or testing the application on a mobile device or emulator as you build, then choose yes by typing Y and pressing Enter on your keyboard, else type N and continue. 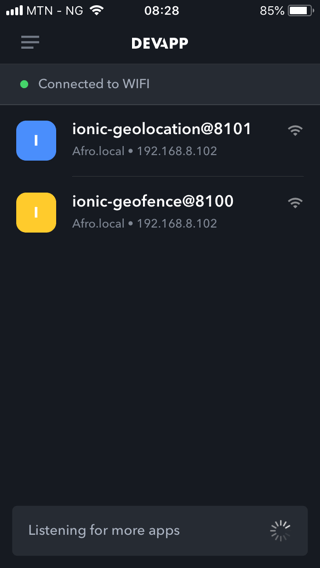 You might get another prompt "If you would like to integrate ionic pro ?" , we wouldn’t be needing that in this tutorial so just type N and if you would like extend the project into production with your team choose Y. The calls to our endpoint will be coming in from a different origin. Therefore we need to make sure we include the CORS headers (Access-Control-Allow-Origin). If you are unfamiliar with the concept of CORS headers, you can find more information here. This is a standard Node application configuration, nothing specific to our app. Also, you’ll notice that we installed Pusher library as a dependency. Create a Pusher account and a new Pusher Channels app and get your appId, key and secret. We use this package to make sure we don’t add sensitive information like our appId and secret directly into our code. To get these values loaded into our environment, we'll create a .env file in the root of our project. If you noticed, we added the dotenv package at the start of our file. This is done because we need to make the variables available throughout the file. Please ensure you replace the following placeholder values above with your unique Pusher appId, key and secret from your Pusher dashboard. We created a POST /vote route which, when hit, triggers a Pusher event. We used object destructuring to get the body of the request and also the player info sent by the user. The trigger is achieved using the trigger``() method which takes the trigger identifier (vote-channel), an event name (vote), and a payload. The payload can be any value, but in this case, we have a JS object. This object contains the name of the player being voted for. We still go ahead to respond with an object containing the voted player string so we can update the frontend with the data. In the code snippet above, we looped through playerData`` to create a view based on the player’s information. There are some undefined variables in the code snippet above, don’t panic yet, we’ll define them in our home.ts file below. In the HTML snippet, we referred to some variables that weren’t yet defined. We’ll create the variables here with the logic behind our application, and import the HttpClient service. send``Votes``(): this method makes use of the native HttpClient service to make requests to our server. It sends the name of the player being voted for in a POST request to the server. When a response is returned, it sets the voted property to true signifying that the user has placed a vote. 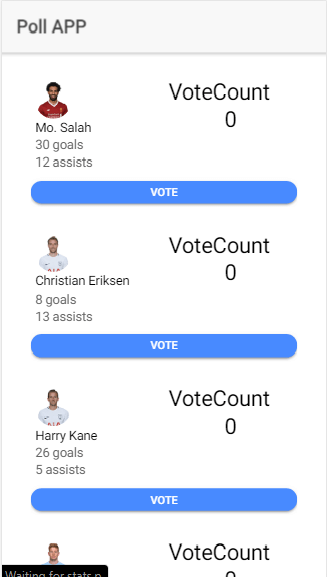 Also, it sets the vote property to the name of the player being voted. getVoteClasses``(): this method sets classNames on each player element based on if a player was voted for or not. So far we have an application that enables users to cast votes, but we have no way of keeping track of how others voted in realtime. We also have no way of visualizing the polling data. To solve both of these problems, we’ll include the Pusher library. To make the provider available in the application, import it into the app.``module.ts file. We’ll make use of this provider in our home page, by binding to the vote event and increment the votes of the voted player returned in the event. This will be done in the ionViewDidLoad lifecycle. At this point, your application should have realtime updates when votes are placed. Ensure that the server is running alongside the Ionic development server. If not, run node server and ionic serve in two separate terminals. Both terminals should be opened in the root folder of your project. You can also run the following code in your terminal if the above method doesn’t work for you. Copy the forwarding url with https and place it in the home.ts file that previously had http://localhost:4000/``vote. Please do not copy mine from the screenshot above. Now you should be seeing realtime update of the votes, both on the phone and the browser.